I started using VMware when it was introduced in one of my classes at ECPI University, where I received my Bachelor’s degree. We used VMware Workstation to set up an Active Directory infrastructure along with Exchange. I thought it was amazing that I could run multiple guests on one PC. It was during this time that I had the opportunity to technical edit a book called “Virtualization: From Desktop to the Enterprise.” I learned a lot about ESX and bare-metal hypervisors. I was hooked. VMware wasn’t as ubiquitous as it is today, but I knew that it would be a hot technology by the potential for hardware savings alone. I looked into specializing in virtualization during this time. The VCDX came out when I was well on my way to specializing in virtualization technology. I had achieved my VCP and was working as a server administrator responsible for designing and implementing one of my company’s first proper virtual infrastructures on Virtual Infrastructure 3 (VI3). It was awesome seeing the real impact that virtualization had on the company. 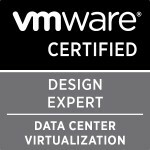 The VCDX seemed like a natural goal for me to differentiate myself and show myself to be a true expert in virtualization technology, both designing and implementing. It took me almost a year to complete the VCDX journey once I filled out the skills qualification review for VCDX3. That was in October of 2009. I found out my results on Tuesday, September 7th 2010 at 1:47 PM EST, a few weeks after my defense the week before VMworld that year. Don’t be afraid to pursue this goal if you are truly passionate about VMware technologies. It may be tough, but the results are worth it. There is plenty of practical advice out there on various blogs and the VMware community forums about the specifics of the process and the panel defense. Research, research, research along the way. Aggressively pursue the first opportunity to do the panel defense. There are only a few per year, and historically only a few per version of the VCDX. You will never feel truly ready to do the defense. You just have to do it and trust that the experience will be valuable no matter what the results are. From a process standpoint, I don’t think I would do anything differently. I work for an awesome company with peer engineers that helped me and supported me every step of the way. They took the time to do a mock defense on several occasions and came up with some creative questions about my design options to keep me on my toes. Even the account managers in my company got involved so I had some questions that I would have never thought of. Having been through the process, I would say that I spent too much time worrying about the process. Yes, the defense will make you nervous. That’s normal. However, I think I spent too much time analyzing what I might do wrong in the defense that I drove myself crazy over the process. I should have just relaxed and trusted that I had a solid design and the experience to get through the process. That’s easy to say now that it’s done. So, I don’t know that relaxing would even be possible. I am still working with the same company that supported me during my VCDX journey. My company has been awesome. They encourage engineers to be at the top of their game. I work alongside multiple CCIE’s and some very talented datacenter engineers that keep me at the top of my game. My company takes good care of all the employees and the VCDX achievement put me in an even better position within the company. The VCDX has changed my life and career for the better. It was absolutely worth it. Categories: Certifications, VCAP, VCDX, Virtualisation | Tags: VCAP, VCAP5, VCDX, VMware | Permalink.